While Claire and Sheila get ready for the final round, it's time for us to play a game. This is called Fact Bag. EISENBERG: ...And filled it with trivia questions. Jonathan and I do not know the answers to these. So I'm going to pick out one. Every question is written on an envelope. I'll read a question. Jonathan and I will discuss. Then I'll open up the envelope and find out the real answer. Here we go - first Fact Bag. JONATHAN COULTON: Fact Big fact. EISENBERG: Budweiser is headquartered in St. Louis, and its icon is the Clydesdale horse. According to the company standards, how much must a Clydesdale weigh to be eligible to become an official Budweiser Clydesdale? COULTON: Well, I don't think you should be judging horses in this way. COULTON: Making them feel bad - imagine if you were a giant Clydesdale, but you're not big enough to be an official Budweiser Clydesdale. EISENBERG: Is it big enough? Or is it a certain size? COULTON: What if you were very large but a particularly hollow Clydesdale? COULTON: Where do you fit in? EISENBERG: What if you've got a dad bod for a Clydesdale? COULTON: You know what, Ophira? I'm working on it. I don't appreciate you - what's a horse weigh - 100 pounds. COULTON: How many of me would you say fit in a Clydesdale? EISENBERG: I would say seven Coultons. COULTON: Seven Coultons in a Clydesdale? EISENBERG: Yeah, seven or eight Coultons. I think they're about 1,000 pounds. COULTON: You're saying regular horses are around 1,000 pounds? EISENBERG: Yeah, I'm guessing. Yeah. COULTON: And so a Clydesdale's another deuce - deuce and a half. EISENBERG: Couple hundred, 300 - all right, 1,300 pounds. COULTON: Thirteen hundred pounds, yeah. EISENBERG: And then what does Budweiser want from their Clydesdales? They want ones with a beer belly, right? They want ones that look like they've had some products. EISENBERG: Fifteen hundred, how about that? EISENBERG: OK, let's see what it says. COULTON: We don't know what we're talking about at all. EISENBERG: We have no idea. Oh, interesting - between 1,800 and 2,300 pounds. EISENBERG: For context, the average horse weighs about 1,000 pounds, yeah. EISENBERG: Other qualifications to become a Budweiser Clydesdale - they must be at least 6 feet tall and at least 4 years old and also, quote, "four white stockings, a blaze of white on the face, a black mane and a black tail." COULTON: Seems like a lot of rules. EISENBERG: I feel very uncomfortable with all of that. COULTON: They're body-shaming a bunch of horses. EISENBERG: Yeah, they're body-shaming a bunch of horses. EISENBERG: All right, here we go. St. Louis is where Lewis and Clark's expedition began. EISENBERG: When Thomas Jefferson sent them out to scout the Louisiana territory, he secretly hoped they'd bring back proof of the existence of what? COULTON: They were going down to the woods. They wanted to find out what was there. EISENBERG: They're going into uncharted territory - so like a monster - like, right? - like Bigfoot. Was Bigfoot a myth - or like Ogopogo or something. EISENBERG: Ogopogo is like the Loch Ness monster of the Okanagan in British Columbia. COULTON: I feel like Bigfoot is not a bad guess. EISENBERG: All right, Bigfoot. A living mastodon - American mastodons went extinct about 10,000 years ago. Thomas Jefferson collected mastodon bones and would even lay them out on the White House floor. EISENBERG: Jefferson thought mastodons could still be alive. And, wow, presidents have been crazy forever. EISENBERG: Jefferson thought mastodons could still be alive and wanted to prove to Europe that America had big majestic animals. COULTON: Maybe you'd like to say hello to my living mastodon. EISENBERG: Yeah, exactly. A 2014 study published in the journal Frontiers of Zoology revealed that dogs react to the Earth's magnetic field in what way? Can they smell magnets? No. Actually I've smelled a magnet before. In my house, I lay out all my magnets. COULTON: Yeah, no, I'm saying they lie down in the direction of the Earth's magnetic field. EISENBERG: Yeah, yeah, right. That's perfect. COULTON: They got to spin around until they feel it. EISENBERG: Right. That's why they go round and round and round, and then eventually they get it. COULTON: That's right. That's my current theory. EISENBERG: True north. OK, let's see. Dogs tend to align their bodies along a north-south axis that lines up with the Earth's magnetic field. COULTON: Hell of a summer job. EISENBERG: ...To reach this conclusion. EISENBERG: OK. That's all the facts we have time for today. 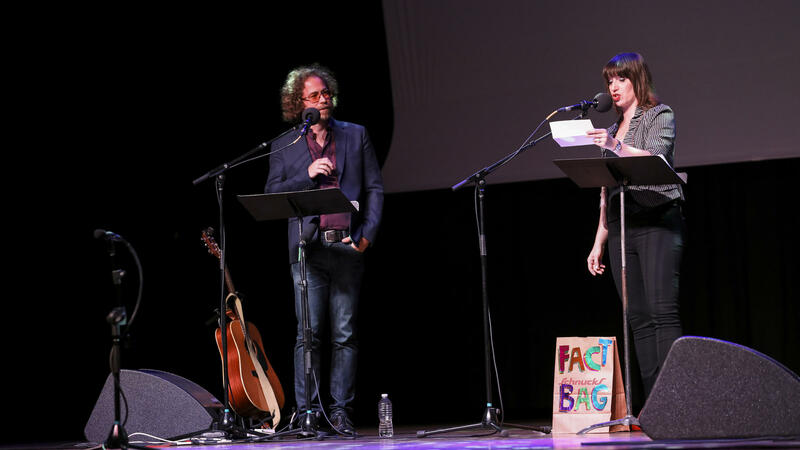 EISENBERG: Thanks, fact bag. Transcript provided by NPR, Copyright NPR.